Want to look like an ageless beauty? Many expensive creams and lotions will fall flat in comparison to this highly recommended antioxidant smoothie. With powerful skin and health-friendly nutrients like avocados, strawberry, spinach, flaxseed and honey; this beauty elixir is all you need to stay radiant forever. Avocados provide vitamin E and healthy fats; both to keep the skin supple. Strawberries and their pleasant berry color bring in vitamin C, folate, fibre, and a whole range of beneficial nutrients. Add omega-3 from flax in this mix and you have a tasty yet supremely healthy smoothie. Place all the ingredients in a blender with the required amount of water and blend them. 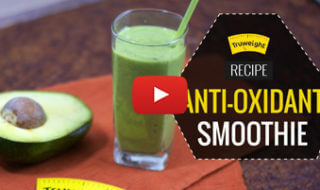 Enjoy your glass of this antioxidant smoothie and defy your growing age! 5 Hacks to a Healthy Daily Routine!